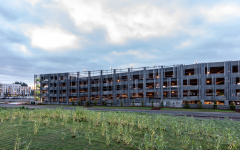 The new First Tech Federal Credit Union corporate campus sits on 17 acres of land in Hillsboro, Oregon. This area is known as the “Silicon Forest” and features several notable high-tech companies. 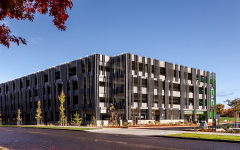 The state-of-the-art 156,000 SF office building is one of the largest cross-laminated timber buildings in the United States. 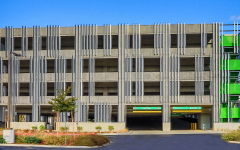 The northern portion of the campus includes a new five-level, 530-space parking structure that serves First Tech’s employees and visitors. The exterior design of the structure incorporates a unique metal-fin cladding system, emulating the office building façade. Open stairways in opposite corners of the floorplate are highlighted using a bright green accent color. 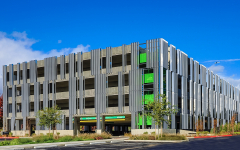 User amenities include electric-vehicle charging stations and a bicycle storage enclosure.